Inspired by a segment featuring Rick Bayless' daughter Laney this afternoon on Channel 10, The Wife (...who is writing this! Don't you just love third person?) 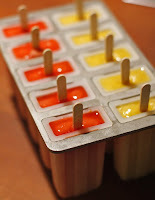 made paletas with a popsicle mold we'd used a couple of times last summer and had forgotten was in the cabinet that stores all miscellaneous kitchen items. Around here, we heart paletas so, so much. When we go to Nashville for a quick vacation, we must go to Las Paletas on South 12th Street multiple times. The hot-chili-chocolate, the tomato-cucumber, the tamarind, the hibiscus flower -- wow. It is the best selection of flavors ever. Hello, popsicle binge! Blend first 3 ingredients in food processor. Add club soda and pulse. Pour into molds, add sticks, and freeze for 3 hours. Let them sit out on the counter for a few to thaw for easier removal. 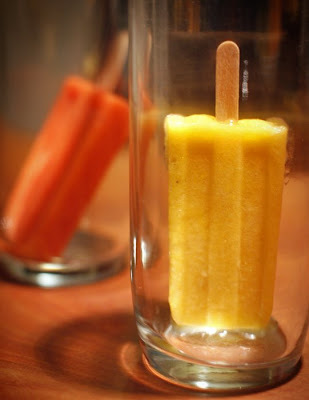 Possibly never buy boxed popsicles again. Chef John Bragg will be hosting a five-course wine dinner featuring tasing portions of fine vegetarian dishes on Wednesday, September 3rd at Circa. The dinner will feature red curry-coconut soup (pictured), mock duck cassoulet, spring rolls, sweet potato flan, and crepes for dessert. TCV is very excited. We already have our reservation, and we hope to see all of you there. Remember, you do not have to be a vegetarian to enjoy this meal. This is culinary experience for everyone that is not to be missed. The Wife and I did a story in The Memphis Flyer on Chef Bragg and what led him to do a totally vegetarian dinner at his restaurant. You can read it HERE. The September 3rd dinner begins at 6:30 pm and is $55 without wine pairings or $75 with full pours of wine. Please call 522-1488 to make your reservation. Circa is located at 119 S. Main in downtown Memphis. Please let me know if you are planning on going and TCV will keep an eye out for you. Bloggers, please help get the word out on this truly unique culinary event. I guess this is how it is supposed to work. I blog about the food I make in my kitchen and secretly hope that some one will be inspired enough by what I create to try it in their own kitchen. I also secretly hope that they take my recipes as inspiration rather than as gospel truth. I hope that they will find a way to make what I made better (or at least slightly different) than I did. I believe that flexibility is the key to kitchen happiness, and finding interesting substitutions is the path to culinary creativity. 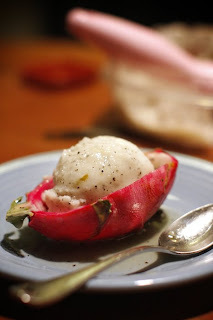 That said, I made dragon fruit ice cream that I first spotted on Paul Knipple's blog Squirrel Squad Squeaks. 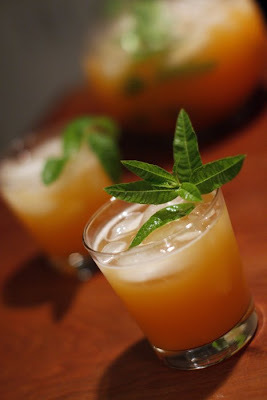 Paul got the idea from a blog called Mike's Table who in turn attributes the original recipe to a blog called Coconut & Lime. Are you able to keep up here? Everybody is making it, but everybody is adding their own little twist. For my take on this cool dessert TCV added a pear to the mix and drizzled a honey-lime syrup over the top for an extra layer of tangy sweetness. Equal parts lime and honey go into a tupperware. Shake. Everything goes into a food processor, and is blended until just smooth. Do not over blend, because you don't want to crush all of those tiny black seeds that are in the dragon fruit. Pour the mixture into your ice cream maker, and turn it on. Read a magazine, walk the dogs, call your mother, do anything to distract yourself for about thirty minutes while this delicious dessert is freezing up. 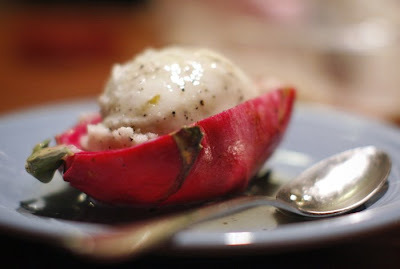 Then scoop the ice cream into the reserved dragon fruit skins and top with the honey-lime syrup. The presentation alone makes this dessert well worth the effort. 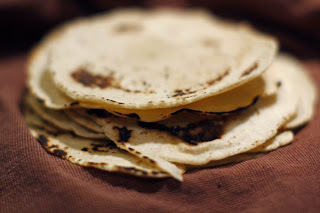 Dear reader, please let TCV know if you have made one of my recipes. That would thrill me to pieces. Welcome to Chubby's Steak House. We don't often get to break out the steak knives, but we needed them tonight. This dinner was inspired by the ginormous portobello mushrooms I found at the Winchester Farmer's Market this weekend. The sauce was inspired by a dish I had in NYC at Kate's Joint. 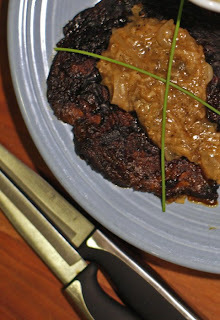 They called it "Fake Steak Au Poivre," which is French for pepper steak, I think. The best part of the Kate's dish was the gravy. It was a spicy, peppery, brown gravy with tons of fresh horseradish served on top of sliced mushrooms and fried tofu. 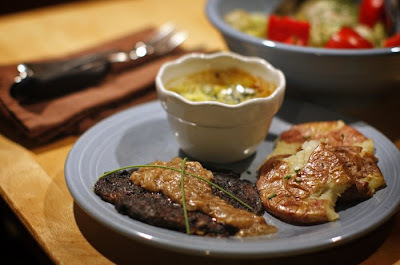 I went tofuless for my version and served my take with some fun smashed potatoes, side salad, and creamed spinach. Place all ingredients except oil into a food processor and blend until smooth. While the processor is still on, drizzle the olive oil in slowly. You want to leave the food processor on until the marinade emulsifies. You will know when this happens. It will thicken and lighten in color. Coat the mushrooms with the marinade you just made, cover, and stick in the fridge for a few hours. Over medium heat, melt butter and oil until it stops bubbling. Add the flour, stir constantly, and cook until it turns the color of an old penny. Add the horseradish and onion and cook until translucent. Add pepper. Add stock and allow to thicken. The horseradish will mellow and become sweet as it cooks, much like garlic does. Now grill those marinated mushrooms on a hot grill until you get some nice grill marks on them. Finish cooking them while covered in a hot oven. Place the mushroom on a plate and spoon about 2 tablespoons of the gravy on top. Get out your steak knives and dig in. Who says vegetarians can't have steak? Ahhh...a day off. I got 6 miles in this morning and spent the rest of the day hanging out with The Wife doing a whole bunch of nothing. It was wonderful. We had lunch at Mayuri, our favorite Indian buffet. The vegetable korma, mushroom marsala, and aloo gobi fry are pretty standard offerings on Mayuri's lunch buffet, and they are surely hard to beat even when ordering off the menu at other Indian joints. The Wife always ends the meal with a healthy dose of the sweet milk pudding which contains noodles, tapioca, vanilla, and spices. TCV has no room for such frivolities when there are curried vegetables to be eaten. Bellies full and wanderlust in our hearts, we decided to venture into new territory. Our friend Michael has been talking up the Winchester Farmer's Market, so we decided to check it out. You, dear reader, have to go. We were greeted at the door by a huge loudspeaker blaring Mexican pop music; additionally, it was lashed to a metal post with chains. The party atmosphere was clear from the get-go. The store itself is damn near as big as a Costco, and full of exotic fruits, vegetables, and strange housewares. We spent the better part of an hour searching the aisles, reading labels, and squinting at foodstuffs we had never seen before in an effort to figure out what it was and if we could use them. The great thing is that wares from many cultures are available all in one place, making for easy Saturday shopping. The pink quinceanera decorations dotting the front wall, the decorated plastic-jug checkout lane lights, a housewares section emblazoned "GLORY AND BEAUTY," box upon box of fluorescent, grinning piggy banks, and the tearstained babies mollified by giant chocolate lollipops in their carts -- all of this stuff to see adds to the raucous experience that is this market. We left with a 5-foot section of sugar cane, eight spiny rambutans, fresh green dates, rice flour, white peppercorns, an aloe vera drink, a scarlet piece of dragon fruit, 3 huge portobello mushrooms, Mexican crema, a pound of pine nuts, and some bamboo skewers. 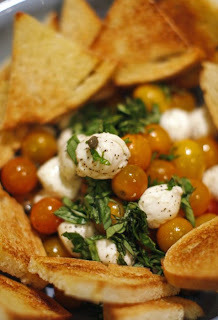 Later, we snacked on baby heirloom tomatoes that I mixed with fresh basil from the garden, capers, buffalo mozzarella, olive oil, and white balsamic vinegar and served with toast points. I recall thinking that I was really going to miss all of this freshness when winter finally arrives. The only thing from the market that made it to the dinner table was the skewers. 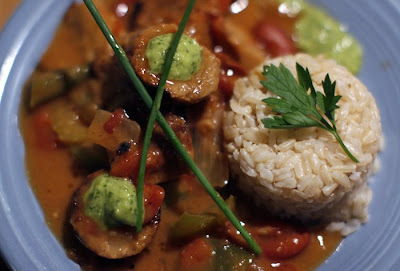 It was getting late, so TCV decided to do something simple for dinner: harissa marinated seitan skewers over cous cous. Mix all ingredients. 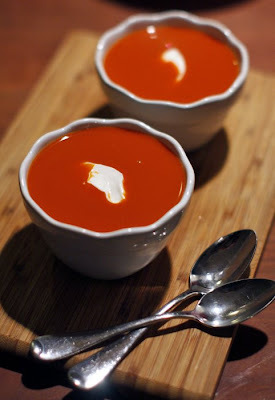 You will just need enough olive oil to dilute the harissa/ lemon juice mixture to a salad dressing-like consistency. Thread the seitan onto the skewers; brush with the harissa marinade. Throw them on a medium-hot grill until desired doneness is achieved. 1 box of Near East roasted garlic and olive oil cous cous. Cook the cous cous according to package instructions and then fold in the rest of the ingredients. 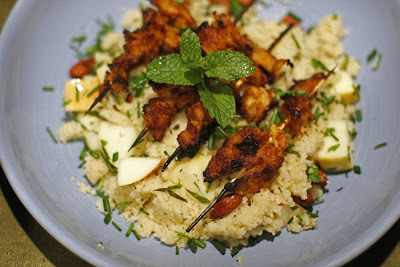 Spoon apple-mint cous cous into the center of a platter, then top with the seitan skewers, a bit more mint, and chives. The whole dish takes about ten minutes from start to finish, which leaves me time to do more important things like figure out what the hell I'm going to do with 5 feet of sugar cane. Any takers? When I was a chubby vegetarian kid, I would beg, plead, or do just about anything to get my parents to take me to La Montagne (formally located at 3550 Park Ave.) It was the kind of place that bigger, more progressive cities had, but it was smack dab in the middle of Memphis, TN. They served oat burgers, spinach fantasy, pesto pasta primavera, nachos, and toasted ravioli--all totally vegetarian. But the reason that I had to go, the reason that I'd do anything to get there, was the tofu fajitas. There were magic. I ate them for lunch or dinner nearly once a week for over 10 years. It was the favorite restaurant of The Wife & me. If you are what you eat, then I'm a tofu fajita. I can still remember Terry razzing me as he did every time I went in there: "You want a menu? Because I already know what you're going to order." He was right. I'd take the menu, look it over, and order the exact same thing I always did: fried tofu, onion, mushrooms, green peppers, lettuce, pico do gallo, a huge-wheat tortilla folded into quarters, and refried beans on the side. The weird thing about the fajitas was the way that they were served. They put the warm tofu mixture over the top of the lettuce. All of a sudden, one day La Montagne was gone. The "For Sale" sign in the front garden told the story. It said to me that there would be no more fajitas or oat burgers or smoothies. TCV was sad. Then one recent Monday night, I ran into Chef John Bragg at a local watering hole. We tipped a few back and talked about food. I told him that he had my eternal respect because he was the chef at my all-time-favorite restaurant La Montagne. This conversation birthed the idea for a story which will appear in the next Memphis Flyer. 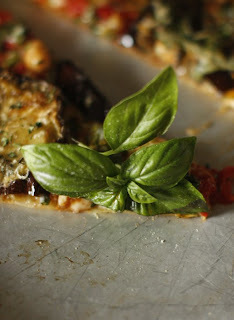 John cooked amazing vegetarian dishes for us in his kitchen at Circa, The Wife wrote the piece, and TCV took the pics. 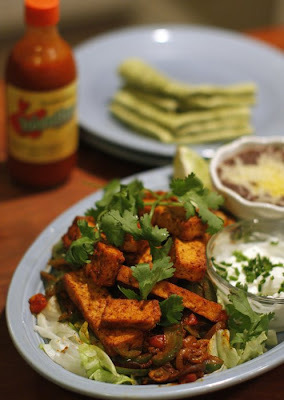 Most importantly, Chef Bragg gave us, and you dear reader, the recipe for the much-missed La Montagne tofu fajitas. Read it Wednesday, when the paper comes out or go online for it. And see what's coming up that you will just have to attend this September 5. Place tomatoes & garlic on a roasting pan & drizzle with olive oil. Roast tomatoes & garlic in a 5oo degree oven until you see them start to turn black on the tips. Transfer tomatoes and peeled garlic to a blender cup, and blend on high for a few minutes or until smooth. Strain into a saucepan. Simmer on low until you are ready to eat. Add salt & pepper to taste, and then garnish with greek yogurt. Juice the cantaloupe by blending the flesh, and then straining it. You will likely have to do this in batches if you got a gigantic Whitton Farms cantaloupe as TCV did (thanks Keith & Jill.) Squeeze the lemons into the juice, and then add all other ingredients. The salad is pretty self explanatory. Sorry there are no stories about grandmas or food origin, but I gotta go. TCV has got to make a living too, and today is a busy, busy day. Here are a few quickies for you. TCV knows that sometimes it is harder to figure out what to make as a side-dish or dessert than it is to figure out what you want to make as your main course. So here are two suggestions. Instead of frying or mashing those potatoes do something more interesting and flavorful (not to mention more healthy) with them. Quarter some new potatoes, toss them in a little bit of olive oil, and then place them on a non-stick baking sheet. Roast in a 5oo degree oven until golden. 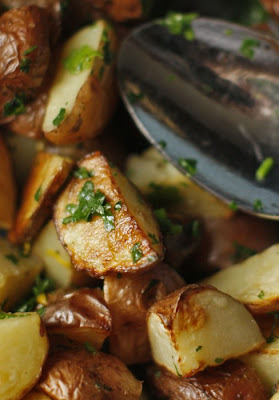 While they are still warm from the oven, toss the potatoes with a handful of chopped parsley and the zest from one lemon. Add salt and pepper to taste. There, now you have yourself a delicious and healthy side of potatoes that will go with just about anything. My mother-in-law baked me some really moist and chewy peanut butter cookies. Isn't she sweet. So I immediately woofed a few down with a cold glass of milk, and then I decided the save the rest. Later, The Wife and I made some homemade chocolate ice cream, and sandwiched the ice cream between two of the peanut butter cookies. 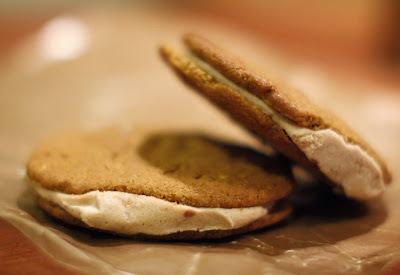 We wrapped the ice cream sandwiches in waxed paper and stuck them in the freezer to get a bit more solid. The next night we had them for dessert, and let me tell you they were fantastic. It tasted like a giant frozen Resse's Peanut Butter Cup. We are now on Veg Blog Search. It is a search engine that helps the veggie among us find what to make for dinner. Check it out, and root around for a while. You will find some great recipes. I love pad thai. It is simple, hearty Thai-style noodle dish that is great anytime, anywhere. 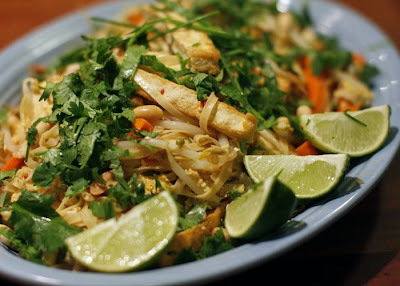 Pad thai gets its unique sour flavor from tamarind, a native African tree fruit that has long been used in a wide variety of Indian, African, Asian, & Mexican dishes. I found an easy-to-use tamarind paste at the Viet Hoa Market on Cleveland in Memphis, TN, but it is available in a variety of forms. This is my version that omits the shrimp and the fish sauce that is traditionally found in this dish. The ingredient list seems long, but it is a very simple dish to make once you collect everything. Cook shallot until translucent in a bit of sesame oil, and then add cooked noodles and sprouts. Turn the pan up to high. You will need to have everything ready at this point because it starts to move very quickly. 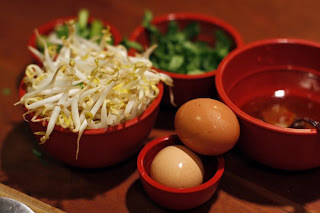 Push the noodles aside, crack the eggs into the bottom of the pan, and allow the eggs to set. Mix the eggs with the noodles. Add the sauce, carrots, tofu, & spring onion. Flip the pan to mix ingredients. If your noodles look dry at this point, add a bit of the water you cooked the noodles in to loosen the mixture. Once everything is warmed through, transfer to a serving dish. Garnish with the peanuts, cilantro, and the limes. During the summer, there is one thing that my grandmother, Biee, kept on hand in the fridge...summer salad. For you yanks or unknowing-southerners, this is a salad consisting of tomatoes, cucumbers, & onions floating in vinegar, sugar, water, & oil. Biee's summer salad was so sweet some might have called it dessert, but I called it my favorite snack -- especially on a hot summer day. I can still remember rooting around in the fridge looking for the light-green tupperware with the white top that held all of summer's bounty. I'd stick my chubby little fingers in there and fish out the best looking tomatoes while no one was looking. 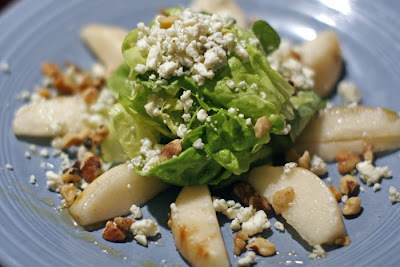 This salad is crisp, flavorful, and delicious. I updated this classic with heirloom tomatoes, white balsamic vinegar, & whole parsley leaves. 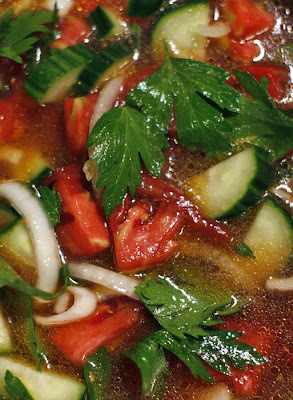 Throw the tomatoes, cucumber, onion, & parsley into a bowl. Make enough dressing to cover, then pour over the top of the salad. Let stand in the fridge until you are ready to eat it. Serve in a bowl. No lettuce required. If you look through the posts on The Chubby Vegetarian, you will notice that I'm nutty about two things: tomatoes & pizza. I called my brother yesterday to check in with him as he had been out-of-town for the weekend. He said that he'd have to call me back because he was passing through Nashville, and was about to order a pizza from Mellow Mushroom. I began to salivate like one of Pavlov's mutts. Before I knew it, I had convinced him to order me a large cheese pie and bring it back to Memphis with him. The wife flatly refused to eat a pizza that had traveled such a long distance without refrigeration, but I did not mind. 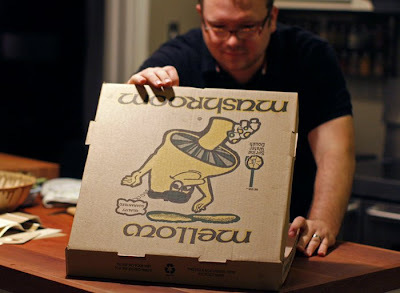 Mellow Mushroom produces some of the finest pizzas I have ever tasted. They just get it. The crust, the sauce, the cheese are all damn near perfect. TCV's no expert, but I have rolled my fair share of sushi. It's really easier than you'd think. The main ingredient is patience. Besides that, you will need some specialty ingredients and tools to do it properly. You will find most or all of these things at your local Asian market. Toasted nori: This is the seaweed in which you wrap & roll your rice & veggies. Sushi rice: This is a high-starch rice that is sticky. Without it your rolls will be a disaster. Wasabi: This is the green paste you love to hate. It is delicious, but it burns. Sushi mat: Tiny sticks of bamboo tied together. This you will use to get a tight roll. Then decide on the veggies you want inside the roll. I like sprouts, carrots, chives, fresh herbs, avocado, cucumbers, & mushrooms. I also like to add a bit of cream cheese to one or two, because it is delicious that way. I marinate the portobello cap in soy sauce and ginger, then grill it in a pan with some sesame oil. Then I slice the cucumber, carrot, mushroom, & avocado into long thin matchsticks. Now you are ready to get started. 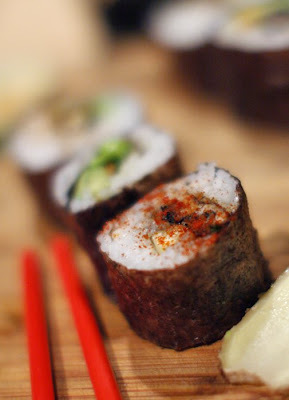 Lay one piece of toasted nori onto your sushi mat and cover with a thin layer of cooked and cooled sushi rice. Allow a 3/4-inch margin at the top & bottom of the nori. 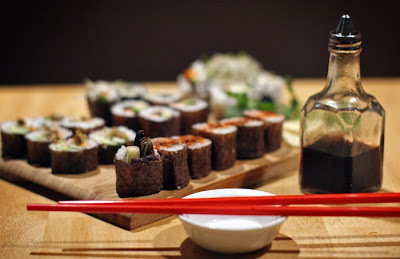 Decide on three or four of the ingredients that are in front of you, and add them to your roll. I think that chives, cucumbers and mushrooms are a delicious combo. Place each ingredient down end-to-end in the center of the rice bed. Add a tiny bit of wasabi paste down the length of the nori. Put a tiny bit of water on the tip of your finger and swipe it across the top margin of the nori. Start rolling at the bottom as tightly as you can without damaging the roll. Press the damp end of the nori onto the outside of the roll. Use the sushi mat to tighten-up your roll by lapping one end of the mat over the roll and pulling the other end of the mat tight. Using a sharp knife, cut the roll into six or seven equal lengths. Garnish with paprika or sesame seeds and enjoy. You just made your first sushi roll. That wasn't so hard, now was it? Here is a quickie for you. So you have a bunch of beans left over from different things you have made in your kitchen. Maybe you have some black beans, and some cannellini beans, and some chick peas. Whatever, it really doesn't matter. You can use those left-overs to make a delicious snack. For every 2 cups of beans add one teaspoon each of cumin & coriander, one large garlic clove and a pinch of salt. Blend in a food processor until smooth, then drizzle in 3 tablespoons of olive oil. Finish by adding enough water to get it to a consistency that you like. Transfer contents to a bowl and top with cilantro or scallions or mint. A drizzle of olive oil on top, and a dash of smoky paprika gives it a nice, finished look. Serve with pita or toast. Nothing is wasted here in TCV's house. That's right. Much like bringing ice to an Eskimo, I delivered one of my pies to Lou at Lou's Pizza Pie on Young Ave in Memphis, TN. Lou and I talk pizza all the time, and we share many of the same pizza philosophies. 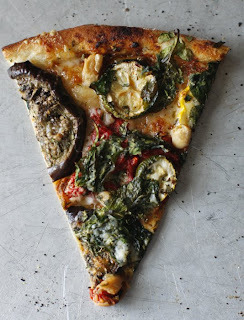 We agree that the perfect pie should be a zen-like balance of crust, cheese, and sauce. The crust should be thin & crispy with a chewy center. Too much cheese and you end up with a greasy mess. Too much sauce and you end up with a molten cheese-a-lanche as everything north of the sauce slides off with the first bite. Balance folks, balance. I was telling him about my beer-bread crust, and he made the mistake of saying that he'd like to try it sometime. Fast forward a few weeks, and I show up at his doorstep with one of my pies. I had par-baked it in my oven, and then stuck it in the freezer when it was about half cooked. Lou took the pie from me and popped it into his REAL pizza oven. While my pie baked, we sat and chatted about the week he spent in NYC eating nothing but pizza. A week in NYC eating nothing but pizza for breakfast, lunch, and dinner -- that is the kind of research The Chubby Vegetarian could get into. Though my pizza got a little too done in the REAL pizza oven, Lou still seamed to enjoy it. We tore into the pie as we discussed the finer points of making a pizza sauce, and the pros & cons of adding whole-wheat flour to a crust recipe. I sipped on a Sam Adams, and Lou pounded a Red Bull as it came down to the last slice. It was time for me to cut out. 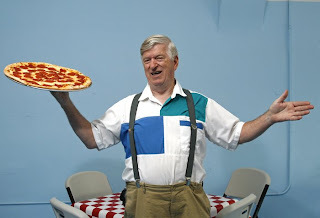 For those who have not tried Lou's Pizza, he has a unique signature-style pizza that is really, really delicious. 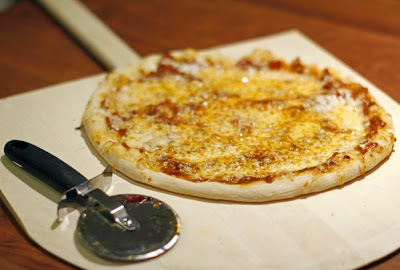 He uses a little bit of whole wheat in his crust and the sauce goes on top of the cheese on a pinwheel design. His pizza is a few bucks more than other places, but you get a superior pie. I have eaten a lot of pizza in my time, and Lou's is at the top of the list. Drop in and try it out. I think you'll love it. This version is made with jicama, broccoli, green peas, carrots, purple cabbage, celery, garlic, black Thai rice, & jasmine rice. 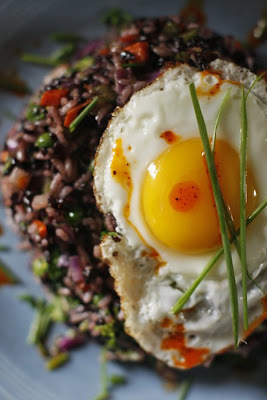 I serve the fried egg on top because I think it looks really cool. There was a time that I thought that if I ever saw another plate of pesto pasta, it would be too soon. You see, the minute that someone hears that you're a vegetarian and realizes that they have to feed you at some point, they would bust out the pesto pasta recipe...if you're really lucky, they'll throw in a portobello mushroom cap. I have been a vegetarian for 20+ years; needless to say, I have had my fill of the pesto. Then I spied a vegan version of pesto pasta on Vegan Crunk, and my interest in the dish was suddenly rekindled. I decided that pesto doesn't have to be boring. It needn't be the same. So I left the parmesan out of the classic pesto recipe, and added some parsley. 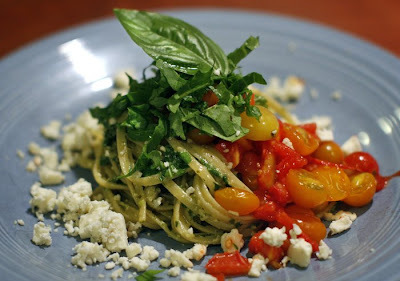 I tossed the pesto with the pasta noodles and topped it with chopped arugula and baby heirloom tomatoes from the farmer's market. Finally, I finished it with crumbled gorgonzola (Gorgon Zola: King of Cheese). This was the perfect spicy lift after Kelly and I ran 4 miles in the heat of the day. The Wife even joined us for the last mile. Rolling up to an innocuous new Germantown pizza joint last Sunday in Hunter's Hummer H3 with Lord T and Eloise's unreleased-as-of-yet album blasting, we had a sentimental moment. Oh, G-town: we kind of miss you now! How safe you are, and how you never jar our eyes due to your strict signage codes and tasteful, neutral colors. We felt like we were back in 1993, when we itched to get the heck out at any cost. Only this time, we were back, wondering what kind of pizza your gorgeous, empty new shopping center might have on offer. Well, one word just about sums it up: soggy. Before we arrived, Dad ordered two veggie pizzas, which is really never a good call. 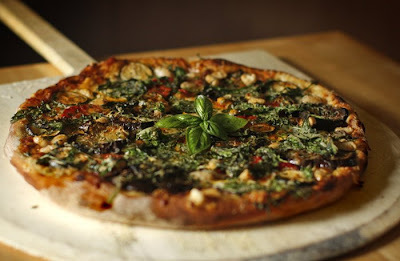 The Chubby Vegetarian has a few rules about pizza: three ingredients at the most, and if you are trying out a new joint for the first time, it is best to order just cheese. A plain cheese pie will allow you to taste the three most important ingredients: crust, cheese, and sauce. However, they did look promising at first: at least there was no broccoli, a sight unwelcome on ANY pizza. Once we picked up a slice, the waterworks began. All over the pan. Wet crust. Too many vegetables that were not relieved of their moisture in some way -- any way! We like cooking to relieve the day's pent-up stress. We like beginnings, middles, and definite ends. We like people dropping by unannounced. We like curiousity, interest. We like the stories that go along with the food. We like the ones that reach way back to why a certain type of food ended up, of all places, here. We like talking about the best way to make things. We like tasting as we go. We like the dogs refusing to stop begging, their sharp little paws grasping the butcher block, because dinner just smells so good. We like questions. We like all the details that go along with how it's done. We like failing at times because it is likely to lead to some sort of unexpected breakthrough. We like sharing. We like Graham Sr. and Walker stopping by at the magic hour of somewhere close to 5 to stand around with us and talk and pass the time with us in the kitchen. 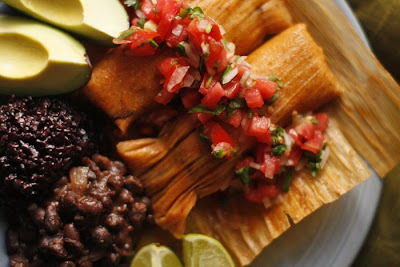 And, finally, we really liked these tamales: seitan and mushrooms filling along with a ground-chile-tinged masa, pico de gallo, and a new black bean / true black rice combo that is surprising enough to make us talk about how it tastes in between bites. We like that it's vegan since we had already descended upon some new gouda cheese beforehand as we talked. We like looking forward to this time of day, every day. We like how reliable it is; no matter how much we actually don't like the day, we know we probably will like all that goes along with dinner. Throw all of the ingredients into a pot with a lid and simmer for 20 minutes or until all ingredients are soft. Transfer everything to a blender or food processor and blend on high for a few minutes or until smooth. Strain. This will leave you with a smooth & flavorful sauce. Throw corn husks in hot water to soak. Saute' mushrooms in oil until tender, then add seitan and continue to cook until some browning occurs. Transfer both the mushrooms and seitan to the pot containing the red sauce and simmer on low for about 30 minutes. Follow package instructions, but add 2 tablespoons of chile powder. Also, I use Spectrum Organic non-hydrogenated vegetable shortening. It is still shortening, but it has no trans fats. Okay, now you are ready to roll. Spread masa doug about 1/8th of an inch thick in the center of a corn husk. Leave about 1/4 - 1/2 inch margins. 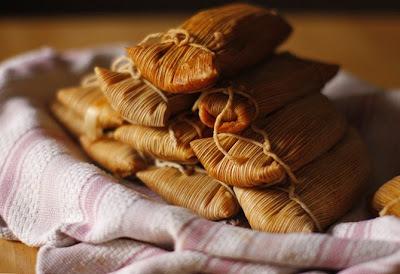 Place a spoonful of the filling in there, tuck one side, and roll the corn husk up. Then tuck the open end under and tie with butcher's string. Repeat until you run out of something. Take those little beauties and steam 'em for an hour. 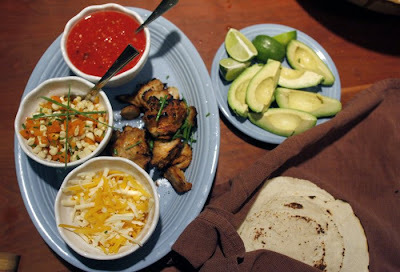 Top with pico or your favorite hot sauce. Eat. 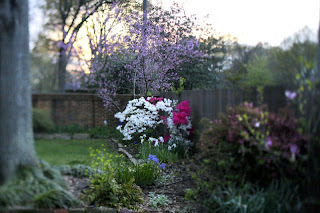 Last night The Wife & I sat, drinks in hand, in our garden. The sun sank behind the oak trees as we bid farewell to the fleeting summer. Our two Boston Terriers wrestled in the yard, and we made a list of our 100 reasons to be thankful for this time of year. I won't bore you, dear reader, with all 100, but many of the reasons we love the summer have to do with the availability of fresh, local fruits & vegetables, and our ability to forge these things into delicious dishes. As the last rays of light leached out of the sky, I cut herbs from the garden to use for dinner. Pasta was boiled, spinach washed, tomatoes and herbs chopped, thanks was given, prayers offered, and our last summer meal was eaten. We could not be sad. This summer was full. We just let this be our annual reminder that we could all be something bigger. Set eggs and milk out on the counter to bring to room temperature. This should take about an hour. To begin, the olive & sesame oil, plus the mushrooms go into a medium pan to cook until they shrink in size and begin to brown. Add the garlic, shallot, butter, and veggie bacon. Cook over medium for a few more minutes while making sure the garlic does not burn. Do this by keeping the mixture moving in the pan. Deglaze the pan with the white wine and reduce. Add salt & pepper to the mixture and taste. Adjust the seasoning and remove from the heat. Cook pasta according to the package instructions. As your pasta is boiling, mix eggs & milk together. When the pasta is ready, remove from the water with tongs and put it straight on top of your mushroom mixture. 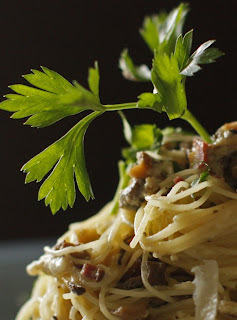 Toss mushroom mixture and the cooked pasta together, and then pour the eggs & milk directly on top of the pasta. You want to work fast here because the heat from the pasta is what will cook the eggs and get them to set. Toss the pasta in the pan until you notice that the eggs have set. You will know it when you see it. 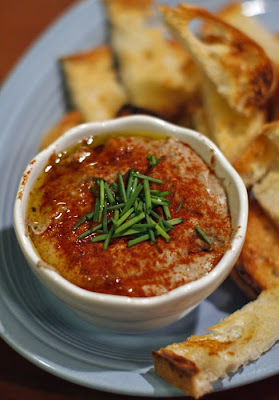 Grab a serving with your tongs, twirl it onto a plate, garnish with parsley & cheese, and then eat. Next time you feel like doing breakfast-for-dinner, do it right...on top of spaghetti. All of the elements of a good breakfast are here: bacon (veggie of corse), eggs, milk, & cheese. What more could you ask for? This is comfort food at its best, and it is made from things that you probably have in your fridge. The classic carbonara is made with heavy-cream and cured pig's cheek. (I kid you not.) TCV's version will save you a few calories, but it is still bursting with good, hearty flavor. I challenge my vegan buddies out there to come up with a vegan version of this. 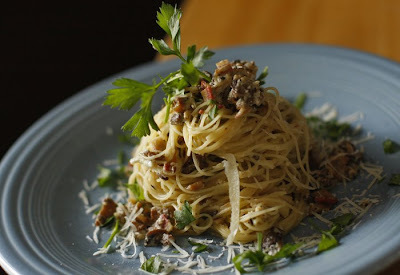 I bet someone out there could make a great vegan carbonara with soft tofu and tempeh. Let TCV know if you come up with anything, and I'll link you up. I don't know if it's gumbo or jambalaya, so TCV calls it "Gumbalaya." No matter what you call it, it's just good food. Add butter to a pan and melt it down. Let it cook on low until it stops bubbling. Add flour and whisk. Keep whisking. Did I say you could stop? I don't think so. You wanna keep this stuff moving in the pan so that it doesn't burn. Keep a close eye on it. When it is the color of an old penny, it is ready to remove from the stove. 3 field roast sausages grilled, then sliced on the bias. file´ with a little bit of water and stir it into the pot. Serve over rice with some french bread with Plugra butter and a good selection of hot sauces. TCV also suggests that you wash it down with a few Abita Turbodogs. In other news, TCV got a really nice mention HERE from the Field Roast people. They say that we have "...a knack for the heart of comfort food, vegetarian style." Thank you, Jennifer. Also, I am running my second 5K tomorrow morning. It is the Elvis Presley memorial 5K, which starts and ends at Graceland. I rounded up a few friends to run with me, so it should be fun. In honor of this run, I trimmed the scraggly beard I usually sport into some mighty sideburns. I'm pretty sure that the burns will make me run faster. The weather is supposed to be great. I will be aiming to beat my previous time of 32 minutes and 24 seconds. I'm looking forward to carbo-loading tonight. It is the best part of running a race. It is a heck-of-a-lot easier to tell someone to check out The Chubby Vegetarian .com rather than all that blogspot.chubbyvegetarian.com garbage. This was good, if I do say so myself, and really very easy to make. I came across some plantains at the Viet Hoa Market on Cleveland in Memphis, TN, and somehow they ended up in my basket. I can't help myself when I go to that store. I always end up with something new or something that I have not tried to cook before. Plantains were on the list of things I had never tried to cook, but now they have migrated to my list of things I can't wait to cook again. The jicama slaw is hot pink, and as most of you know, jicama is usually white. I procured a magical little bag of beet powder from Wild Oats. Anything light in color that you sprinkle the powder on to turns hot pink. It is fun to play with. TCV suggests that you get some for yourself and make a hot pink dinner tonight. 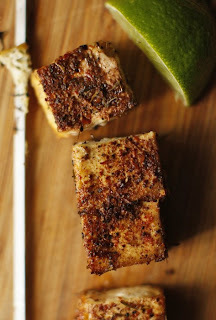 Liberally sprinkle tofu with jerk rub and let sit for one hour. Brush with oil and place in a 500 degree oven for 10-15 minutes or until crispy on the outside. Mix all ingredients in a bowl and keep in fridge until you are ready to use. 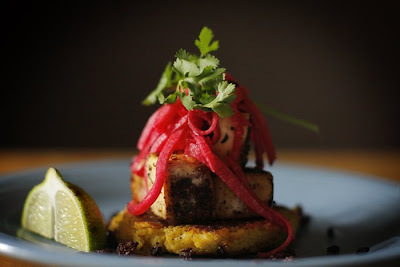 Assemble this dish by placing one plantain cake in the center of a plate, followed by 5 cubes of jerk tofu. 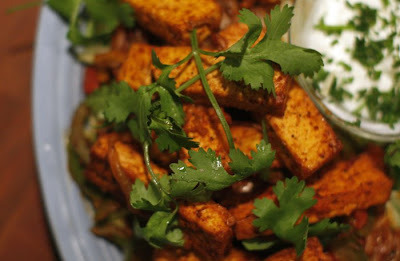 Top the tofu with a handful of slaw and some fresh cilantro. Squeeze a lime onto it, and you are ready to eat. I learned the technique for making this smoky salsa on a Martha Stewart DVD called Martha's Guests: Master Chefs, but I change it up a little every time I make it. I'll try out different peppers or squeeze a lime in it, or add some roasted corn or some cilantro. TCV suggests that you do whatever you are in the mood to do. On high heat, heat up an iron skillet or any thick pan. Place all ingredients into the dry, hot pan. Turn ingredients to sear all sides so that their skins are black. Remove from the heat. Throw one tomato, both pieces of peeled garlic, and the pepper with the stem removed into a food processor and let 'er rip. Blend throughly. Next, add the remaining tomato and pulse until you like the consistency. Add salt. It is so simple that you will never, ever depend on a jar of crappy, store-bought salsa ever again as long as you live. Repeat after me, "I will never, ever buy another crappy jar of factory-made salsa as long as I live." Very good! TCV is proud of you. At a Cordova pool party this weekend, we thought we saw a persimmon tree by the driveway. After asking the host what it was, he said offhandedly, "Oh, those are green apples." Trying to keep our scavenging instincts under control, we said super-casually, "So have you eaten them?" He said sure, but that a lot of them fall and the squirrels get them. we just picked even more! It is always a funny feeling eating something right off of a tree; something that should feel so natural seems weird when you don't get to do it that often. So we shared an apple on the way to the car. It was still warm from the sun and tasted tart and full of flavor. We thought these should go into a galette, not a pie. 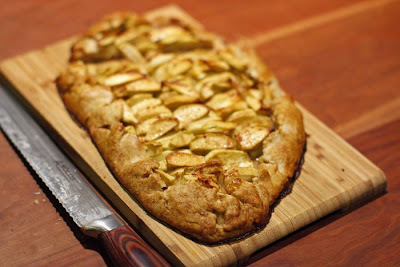 A galette has a bottom crust that is folded over the fruit that's arranged inside. It's less mushy and as a bonus, sounds so very French. You just put it on a silpat-lined baking sheet and brush it with an egg wash about halfway through baking it for a nice shine. The amazing thing is that right after this at the Burks family manor's mailbox garden, we also tasted concord grapes for the first time. Consider this post an open call for us to come raid your fruit trees and gardens! We'll feature your gift of produce right here. The TCV encourages you to share the wealth. Add to this 1/2 c ice water and 1/2 c canola oil. Mix and turn out onto floured board. Roll about 1/3 inch thick. Place onto rimmed baking sheet that is lined with a silpat. Mix it all up and place piece by piece on crust. Fold edges up and press lightly to seal. Drizzle any sauce onto the arranged fruit and sprinkle with sugar. Cook galette in preheated 350 degree oven for 30 minutes or until golden brown. Whisk this up and dab it on crust and filling with a silicone brush after 25 min. I nearly embarrassed myself the other night at dinner with a friend as I professed my undying love for, of all things, cabbage. You see, the waitress had just put before me a beautiful Thai salad with cabbage and peanut sauce. I heard myself launch into this crazy-sounding monologue about the stinky vegetable, but could not stop myself. "I love cabbage so much, blah, blah, blah, kraut, sauteed, blah, blah, cabbage & dumplings, slaw..." As I finished up, a hush suddenly fell over the table, then Chris finally spoke: "I, uh, have never, uh, heard anyone talk about cabbage in that way before." I knew it was time to shut up and eat my cabbage. So here we have it kids, one of TCV's favorite sandwiches in the whole world: The Reuben. The ingredients are simple, but the the result is magical...probably because of the cabbage. Mix throughly, then pour over the mushrooms & tempeh. Let stand for 30 minutes. Throw the marinated mushrooms and tempeh on the griddle. Cook for 10 minutes while watching to make sure they do not burn. You want soft mushrooms and crispy tempeh. 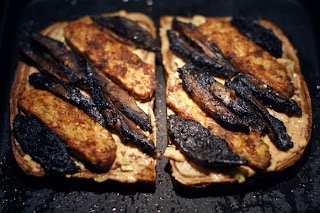 Once the mushrooms and tempeh are cooked, remove them from the griddle. Turn griddle to medium, and slide rye bread onto the griddle. 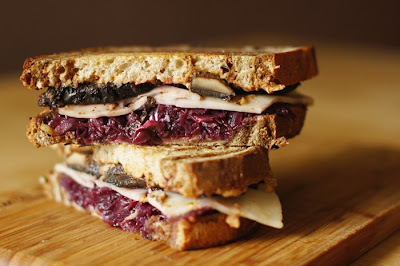 Assemble the sandwich: Russian dressing, slices of mushrooms & tempeh, Swiss cheese, kraut, and top with another slice of rye. Toast the outside of the bread on the griddle while warming the sandwich through. Remove. Slice in half. Bless it. Eat it.